Feeling good about how much Americans donate to charity is easy—until you put the numbers in context. Numbers look good at first glance. Last year, Americans gave $390 billion to U.S. charities, up 2.7 percent from 2015. What’s more? Giving USA Foundation reported that donations grew across all recipient categories, meaning that donors are supporting organizations in a wide spectrum of religion, educational, cultural, international and environmental affairs. Cullen Schwarz, a former communication professional in Washington, D.C., realized that Americans spend a lot on charity, but spend a whole lot more buying things—about $130 trillion, or 333 times more than how much they donate. That friction triggered the idea for a startup where consumers could keep buying things as well as channel their expenses towards social good. Enter DoneGood, a Boston-based online shopping platform that raised over $460,000 in an equity crowdfunding campaign on SeedInvest—bringing the company’s total funding to date to over $1 million. Launched in late August, the campaign will run until Oct. 12. As its nickname suggests, ‘the Amazon for social good’ features products from clothing to home goods, from food to beauty, from 300 brands. 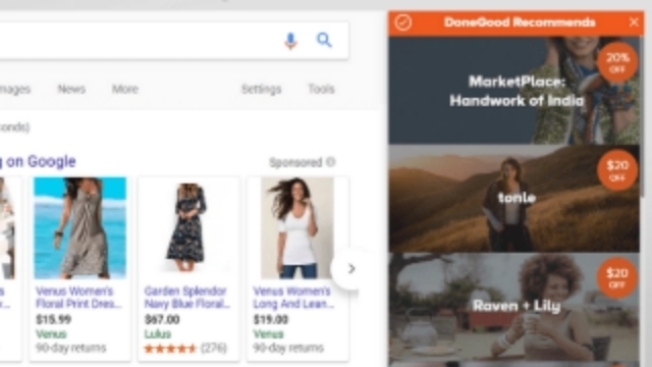 It also provides a free browser plug-in that suggests DoneGood-approved providers when consumers shop online on other platforms. The difference with its monster competitor is that every brand allowed on the DoneGood marketplace makes the world better with day-to-day practices, Schwarz said, including fair pay for workers, no child labor and eco-friendly practices. The process to verify a company starts with aggregating data from independent organizations certifying different types of business, Schwarz said. It moves forward thanks to internal research and info request to companies. DoneGood makes money by earning a commission – around 10% – on sales when users make a purchase from one of its partner brands. Currently in-between office spaces after being incubated at Harvard Innovation Labs, the company will use the crowdfunded seed round to add people with e-commerce experience to its team of five.